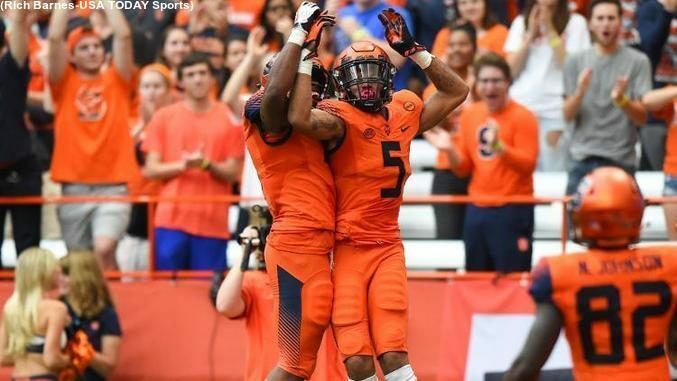 Syracuse football celebrates a touchdown. Mandatory Photo Credit: Rich Barnes, USA Today. 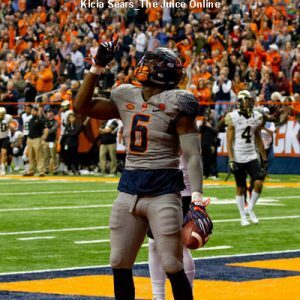 Item: The new early signing period has come and gone for Division I football, with 15 players committing to wear orange for Dino Babers and staff, comprising about two thirds of the 2018 class. With several more slots left to fill when the late (traditional) signing period begins on February 7, Syracuse has a composite ranking of essentially a Top 50 class nationally, and just above the middle of the pack of the 14 ACC programs, bringing in exactly the type of recruit needed to help shed the reputation of SU being an “afterthought” program among elite-level, Power 5 talent. As with any recruiting class only time will tell where this first portion of the class of 2018, Babers third full cycle in the Syracuse recruiting process, ends up in the annals of the football rebuilding project. First step, get back to consistent bowl contention and find a postseason destination for the first time since 2013 (only SU, Georgia Tech, North Carolina, and Pittsburgh didn’t go bowling from the ACC this year), and secondly get closer to being ranked in the Top 25 competing to play in the league championship game. With Clemson building itself into one of the blue blood programs of this century, and the emergence of Louisville, North Carolina State and even Wake Forest and Boston College this season, not to mention the aberration of Florida State’s less than stellar 2017, that’s a tall order. But there’s already been a December victory without even playing in a bowl game. Simply the fact that the NCAA moved to institute an early signing period (this year it was December 20-22) has helped Babers and his staff already add the type of recruit that fits the school’s athletic, academic and community-based philosophies, without waiting for the traditional first Wednesday of February signing date. “I think it’s good for an institution like Syracuse,” Babers said last week in expressing his pleasure of being able to add the 15 new commitments before the Holiday Season was in full swing. As with any recruiting classes there are the sub-stories of surprising additions and subtractions. In the case of this early signing period that was the lamenting of those in Orange Nation over the change of a verbal commitment from highly rated Michigan center Tyrone Sampson who’s opened up his recruitment to all suitors, to the “yes” from Texas quarterback Chance Amie, who was leaning at staying in-state with Houston until his official visit to campus earlier in the month. “We don’t look at it as flipping people, Babers explained when asked about Amie’s change of heart. Preaching the positives is certainly one major aspect of staff’s recruiting pitch; the other is all about building the foundation with talent looking to make a name for themselves while wearing a Syracuse uniform.